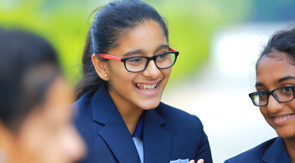 While the market is hugely diverse and the characteristics of what exactly constitutes an international school is a matter of some debate, it is generally agreed upon that they share at least one characteristic in common, in that they offer a curriculum – national or international – different from that of the host country. In the case of schools tracked by the ISC, a UK-based organization that researches trends and developments in the international school market, the curriculum must be taught wholly or partly in English in a non-English-speaking country, with delivery predominantly by a teaching staff of English speakers in order for it to be considered an international school. An exception to the latter rule is when the foreign curriculum is delivered in an English-speaking country, which might be the case for American schools in the UK or schools in countries like Kenya or India where English is an official language. In these instances, schools are included in the ISC database if they offer an international-focused curriculum. Other stakeholders within the industry also believe that a school’s curriculum should emphasize international themes and global citizenship, and this should be reflected in the multinational make-up of the student and faculty body in order for it to be considered international. In the first decade of the current century, the number of students attending international schools grew by 150 percent, from 1 million to 2.5 million. Over the same timeframe, the number of schools doubled to over 5,000, the staff body grew one and a half times. Clearly, the international primary and secondary school market is substantial, resilient to negative macroeconomic trends, and should now be considered a big and thriving sector. Increased mobility of service community means larger numbers of expatriate families around the world are looking for high quality school options for their children. And tied into the internationalization of the labor market is the internationalization of higher education, with credentials from the world’s best universities increasingly seen as the gateway to successful career paths. International schools, therefore, are often seen as the first step on the ladder to finding a place at top-ranking universities and, ultimately, attractive career opportunities. In conclusion with no doubt teachers and other employees working in an International Schools are also will gain their knowledge and grow with this extremely growing International education sector.